A Ghost Story turns a simple image into a meditation on attachment and mortality. It is, of course, perfectly ridiculous to think that a person in a sheet with two eyeholes could represent something transcendently mournful about humanity. The iconography calls to mind It's the Great Pumpkin, Charlie Brown more than it evokes mystery and wonder, and it doesn't suggest that much would be possible in the way of nuanced performance—what with, you know, no visible face and also no spoken dialogue. Yeah, no one would blame you if you shook your head at the whole concept of A Ghost Story and chuckled at the mere sight of one of its publicity photos. The ease with which writer/director David Lowery disintegrates every one of those assumptions is only part of what makes A Ghost Story such a stunning achievement. It's high art overlapping with high concept, careening through past, present and future in a way that's both head-spinning and mind-blowing. Here you find a masterpiece of shifting scale, a narrative that somehow manages to be both deeply personal and truly cosmic—and all of it guided by a person in a sheet with two eyeholes. It's best to go in mostly blind regarding plot details. Suffice it to say that a married couple—Lowery's Ain't Them Bodies Saints protagonists Casey Affleck and Rooney Mara, here identified only as "C" and "M," respectively—is involved, living in a rented house subject to the occasional unexplained bump, bang or discordant sound of something banging on the piano. They seem blissfully in love—until a linens-clad spectre intrudes into their lives in a more unsettling fashion. What follows isn't easy to unpack without telling too much of the story. The mostly dialogue-free narrative—augmented by Daniel Hart's creepy-triumphant score—brings a majestically Zen sensibility to the notion of attachment to places, the inability to move on from tragedy and how we try to find purpose in anything in the face of our own mortality. Them's some heady ideas, and the fact that it's mostly dead serious—save for a couple of hilariously terse exchanges when ghosts encounter one another—is bound to leave some viewers reaching for what it all means, or if it's all just a big ponderous joke. But this is one of those achievements that reminds you of the unique power film can have to move through time and space, as Lowery employs brilliantly concise edits to convey the passage of days and years; one sequence of exactly six cuts carries us over a span of decades with magnificent efficiency. One moment A Ghost Story might have us occupying a Blade Runner-esque near-future cityscape, and the next it might find us with a family of homesteaders in the 1800s. Lowery traps all of these images in a vintage 1.33:1 aspect ratio, even curving the corners so it further resembles something that might have been emerging from a 1960s-era television. As epic as its scope might be, A Ghost Story never stops reminding you that this is also a story about being constrained and limited by the confines of a single place. It's not easy for wordless, even faceless performances to capture these feelings, but A Ghost Story finds room for uniquely evocative performances. Mara brings turmoil to moments as potentially mundane as listening to a piece of music or eating a pie—and she's actually got the easier job. Affleck is left to bring a soul to that cotton-draped apparition, moving with resignation that only occasionally bursts into poltergeist-like rage. The slow stride of that ghost has to carry us through a kind of existential horror connected to wondering if there's ever a time when you can be at rest. If A Ghost Story ever comes close to stumbling, it's when a scene at a party focuses on one guest (Will Oldham) who begins expounding on human attempts to cheat death through creating art. The monologue comes perilously close to feeling like an "in case you missed it, here's our thesis statement" capitulation, but it also captures something about how we attempt to intellectualize fear of death. 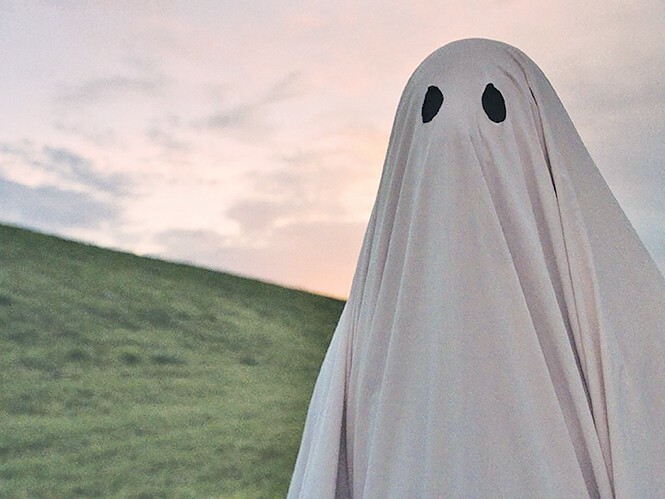 Lowery embraces every possible facet of that fear in A Ghost Story, and the result is absolutely haunting—and not just because of the person in the sheet with two eyeholes.